A few weeks back we were in Holywood for the afternoon, and while we hadn’t set out to grab food in the area, our trip had been longer than expected so our focus quickly turned to places to eat. We don’t know Holywood that well and aren’t regular visitors to the area but we had heard good things about Noble and decided to make it our port of call for dinner. As it was a Wednesday night we were unsure of whether or not we needed to book, and thankfully we were able to get a table without much trouble. The restaurant was pretty quiet when we arrived although it didn’t take long to fill up, which is always a good sign. 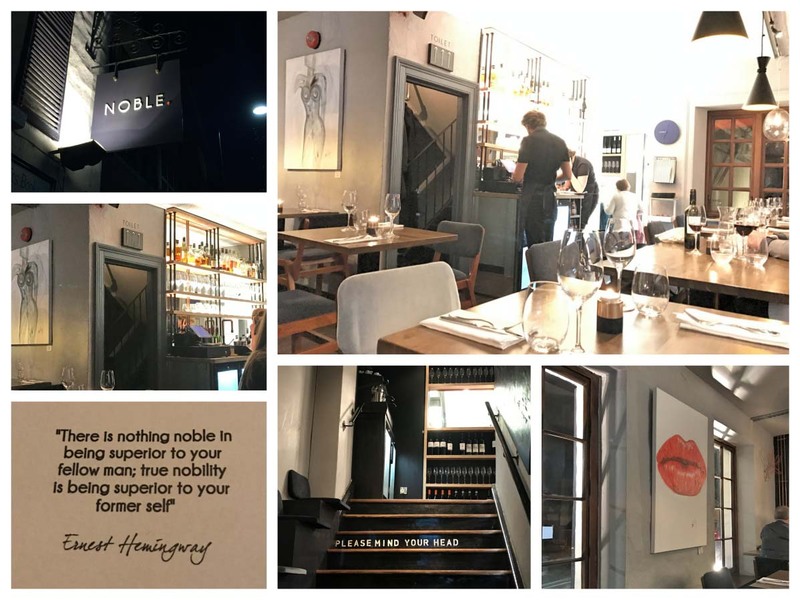 There is a real charm and sense of intimacy about the dining space at Noble, and as we took our seat and looked at the menu, we knew we in for a great dining experience. 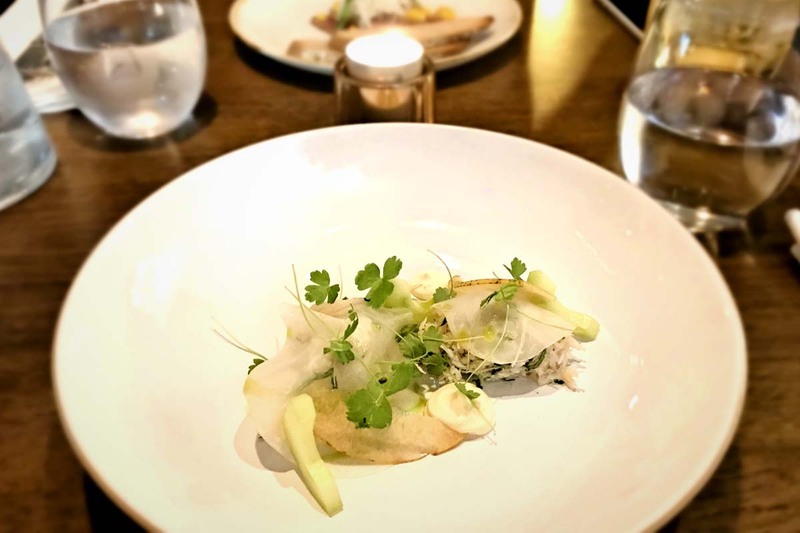 The delicate flavour of the white crab meat was brought to life with the freshness of the kohlrabi, pear and cucumber. This was a really light dish that was packed with great flavour. You could see that every ingredient was treated with great respect and it was the perfect start to a three course meal. The pastrami beef was served chilled and brought to life with the great flavour of the savora mustard. The beef had been cooked in a water bath, and when combined with the mustard, onion dressing and rye sourdough, it was a real treat. A good portion for a starting course and the flavours had certainly left us excited for the main course. 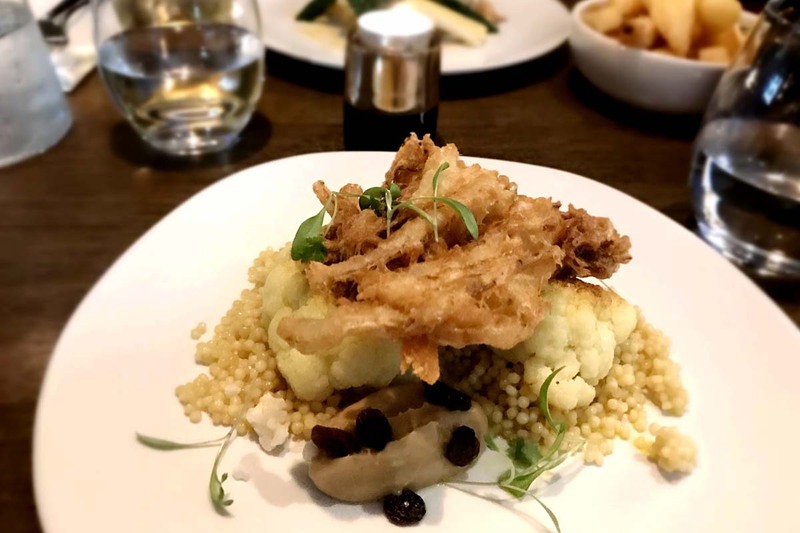 Helen opted for the vegetarian course of roast cauliflower and onion bhaji which was served with raisins, coriander and a spiced cous cous. The sweetness of the raisins balanced the spices from the cous cous and roast cauliflower, while the coriander added a real freshness to the dish. The onion bhaji was lovely and crunchy, adding the perfect amount of texture to the dish. Not only was the dish well presented, it tasted great with all the ingredients perfectly complementing each other. Whether you’re a vegetarian or simply want to try something different in Noble, this dish won’t disappoint. Nial opted for the chicken breast for main, although he was tempted by the range of steaks on offer on the daily specials board. 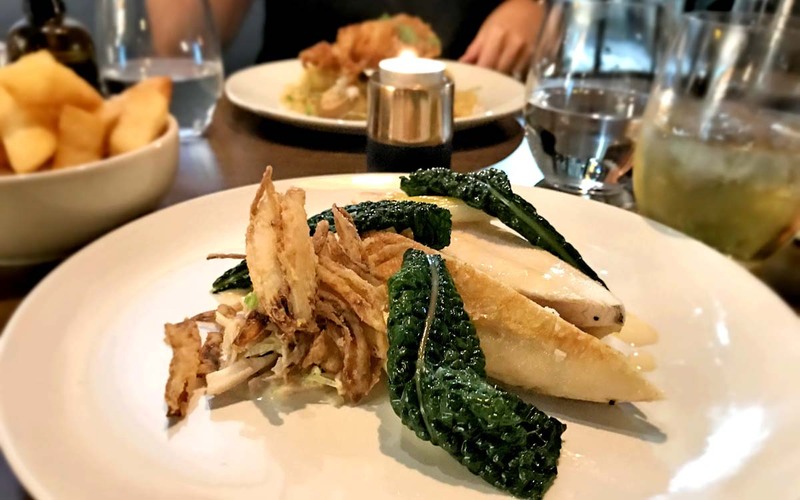 Chicken is something that we wouldn’t usually order when in a restaurant, as we tend to go more towards duck, steak, lamb or venison, mainly down to the fact that chicken is something we eat so regularly at home. It’s also an ingredient that many restaurants really struggle to elevate to the next level, but this was not the case with the guys at Noble. The chicken breast was succulent and had great flavour, while the confit leg was just a joy. The grilled leeks and shallots added an extra bit of crunch and flavour, with the shallots, in particular, a highlight of the dish. The chicken was served with a rich and creamy leek sauce, enough to just complement the dish and not overpower it. Overall this was another great dish, and really highlighted the skill that the Noble team have. We ordered a portion of beef dripping chips with our main courses as we just wanted something extra to enjoy with it. You can’t really go wrong with beef dripping chips and these were crunchy and fluffy in equal measures. For dessert, we decided to share a vanilla cheesecake, although when we took our first bite we instantly wished we had ordered one each as it was incredible. 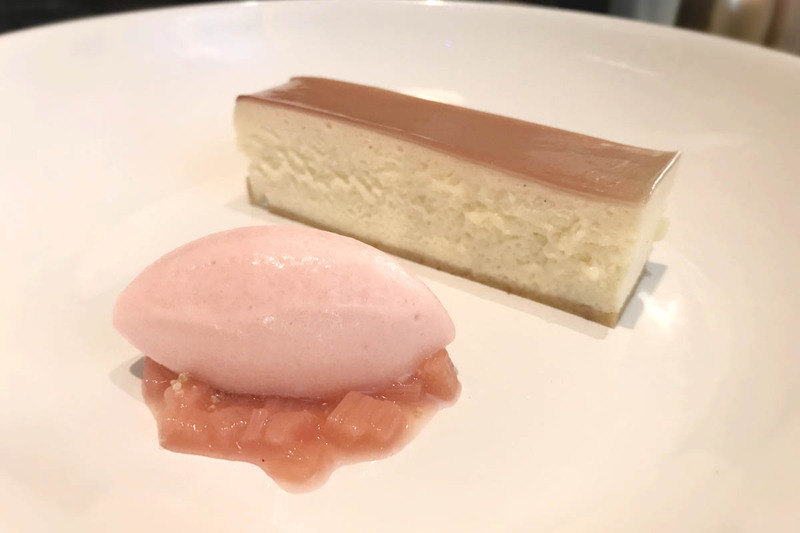 The light and creamy vanilla cheesecake sat on a micro-crumb base and was topped with a rhubarb gel. It was served with a wonderfully refreshing sorbet and small chunks of rhubarb which added zing and texture. A great way to finish the evening, and quite possibly the nicest cheesecake we’ve ever had. We really enjoyed our meal at Noble and will certainly be back the next time we head to Holywood. 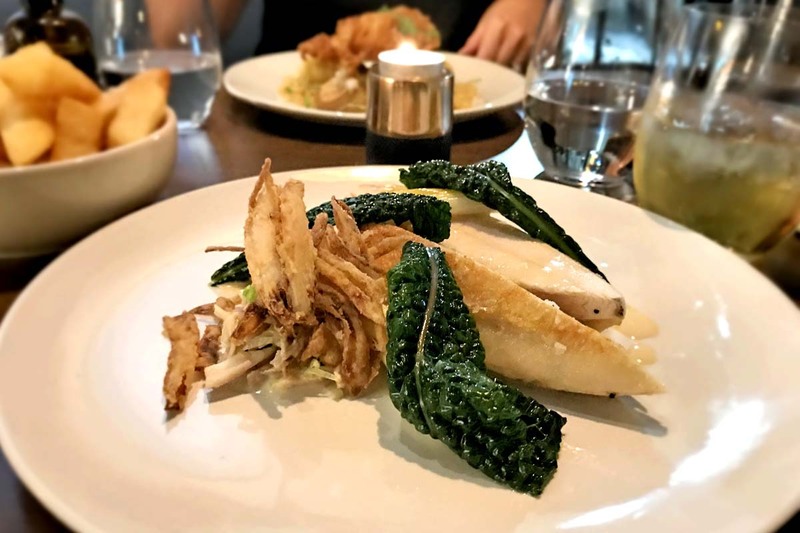 For anyone looking an alternative fine dining experience to Belfast, Noble is well worth checking out. While we didn’t have any problems getting a table (most likely due to the fact it was a Wednesday night), we’d imagine you’d need to book a table for the weekend, and if every dining experience is like ours, we’d suggest you get booking early. Noble really was a breath of fresh air, as both the food and service were top notch. 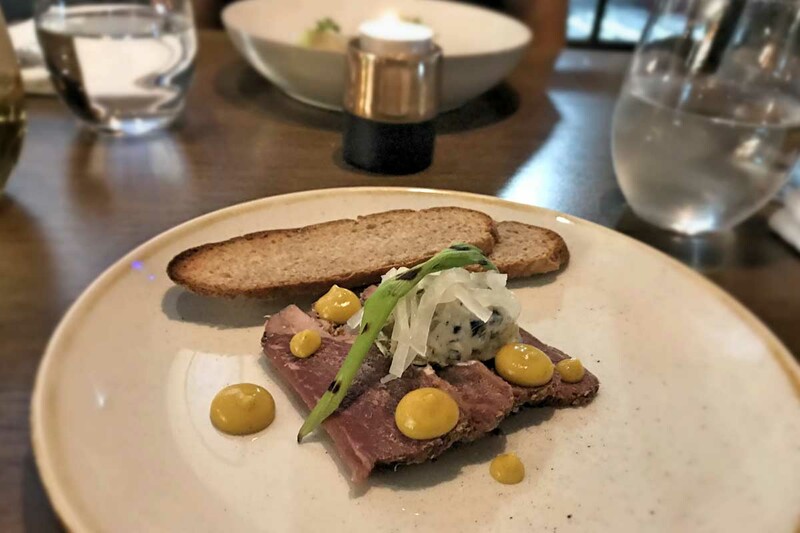 It’s great to see restaurants like Noble doing so well, and highlighting that there’s more than Belfast when it comes to great eating places in Northern Ireland. Pearson, Saul and the team are doing a great job, and with their recent best restaurant in Down award, the guys are certainly going places. Have you been to Noble Holywood at all? We’d love to hear what you thought of it. Let us know by commenting below or connecting with us on Facebook and Twitter. You can also follow our foodie adventure on Instagram. Find out more about Noble Holywood, and check out their menu by visiting nobleholywood.com.